September 11: The BAM Next Wave Festival opened with a month-long tribute to Nonesuch Records, which is one of the great record labels in existence. 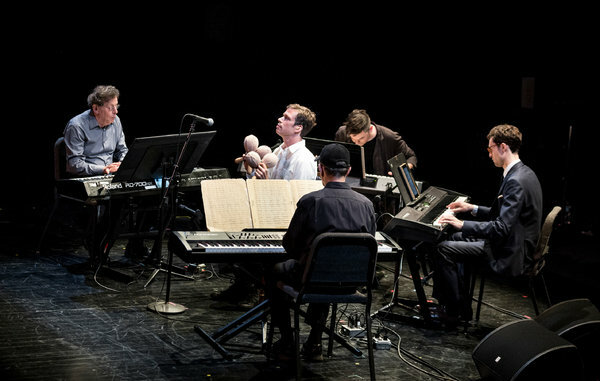 And the first event of the festival was an unprecedented program of music by Philip Glass and Steve Reich, two contemporary composers often mentioned in the same breath as proponents of music that uses lots and lots of repetition — sometimes called minimalist, an adjective that neither composer embraces, and rightfully so. Their music is often quite dense and full and rich, using additive principles from non-Western musics (Indian, Indonesian). The three-concert series at BAM was designed to be a historic occasion with both composers onstage playing together for the first time ever. I’ve interviewed both these guys and have been hearing their work and seeing their concerts for three decades, and I don’t remember hearing that they had some kind of feud going on, but much was made of that in the run-up to these three concerts. I chalked it up to promotional hype, but maybe there’s more truth to it than I know. This entry was posted on	September 22, 2014 at 11:36 am	and is filed under performance diary.